Even though I recently published a book about how I enjoy being a stranger when I travel abroad (detect a shameless plug for my book here? ), the sentiment is often not requited in foreign lands except for those who profit from tourism. Fletcher Christian aside, for much of the history of encounters between strangers the outlander might end up anything from being shunned to being killed and eaten. This is because much of what can result from such encounters can be negative for the host. Strangers bring strange bacilli and viruses, strange beliefs, and they were often drunken sailors who knocked-up your women. So the terms for such alien types were and are rarely complimentary. 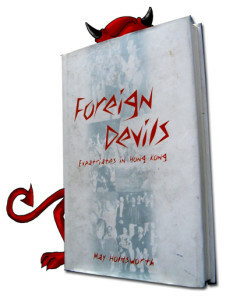 Lo Wai, or foreign devils, is part of a linguistic category that ranges across all countries and cultures. Foreigners might be referred to as palangi in Samoa, haole in Hawaii, gai jin in Japan, gringos in Mexico, farangi in Malaysia or Indonesia, or gweilo in Southern China. None of these terms, and other like them, translate or connote anything nice about the stranger. Some, like gweilo, have softened a bit over time, but in China there remain other endearments, like da bi zi (big nose), that seem rather too personal to me. The tourist’s brief encounter may insulate them from such references, but the expatriate, who takes longer residence and more intensive contact with his or her host society, is more acutely aware of what it is to be among but apart from a foreign culture. Foreign Devils is actually a chronicle of a rather exceptional intercultural circumstance. Hong Kong was a British Crown Colony from 1841 to 1997. So the Brits at least had their own government and public administration, unlike, say, someone who emigrate to a country where they are different in both culture and nationality. The Brits wrenched their island from the Chinese with gunboat diplomacy and then expanded the territory with the acquisition of Kowloon and the New Territories. Geographically they were expats, but not politically. Still, that was countered by the fact that the vast majority of Hong Kong people were Chinese, as was the culture of the place. The Brits were in charge, but they were a sub-culture. There were legitimate reasons for the Chinese to regard the British as foreign devils. Aside from having their land appropriated it must have rankled them to be consigned to the lower deck of the Star Ferries when crossing the harbor until as late as after WWII , to be excluded from building homes on the cooler slopes of The Peak, and suffering other exclusions. Their pretty women could be taken as mistresses and used as “pillow dictionaries” so that Western men might acquire a little bit of Cantonese along with other delights. Sure, there was a lot of outright racism at work here, and in both directions, since the Chinese often thought they had a far superior culture to the smelly Westerners who forced them to conceded their lands. And, as with almost all peoples, they could be just as unjust and brutal with one another as the foreign devils were with them. Moreover, it must be conceded that that British, as did other colonials, did bring some things with them that might be considered blessings—better medicine, technology, industrial processes, etc. that were not without benefit and have since been adopted and sometimes improved by the host society. This book is most interesting in showing how to societies try to maintain some integrity when circumstances and geography throw them together, but it is from the perspective primarily of the British that we see how one of them imports their customs, mores, quirks and prejudices to make themselves feel more at home away from home. Although the term “expats” is used throughout the British really are not until after the handover, when Hong Kong’s political hegemony is no longer theirs. The British population has reportedly declined by 30%, and maybe more will leave, not caring for genuine expat life. One of the major founding hongs, Jardines moved its headquarters out of Hong Kong before the handover, the other, Swire, stayed. Hong Kong is back in the hands of the Chinese. But there will always be a more than a little whiff of British brimstone about the place. Yes, they are still available—best price from Amazon.com—and they make great gifts for birthdays, bar mitzvahs, and the holiday season . . .God, stop me, I’m making myself sick ! These days, with the reputation the Bush administration has built for Americans we are likely to be shunned to summarily beheaded, unless we are worth kidnapping for some ransom. Of course, lest we forget, it took even longer for Rosa Parks to get a seat on the bus in the American South. They probably were, but when you don’t bother to learn their language you wouldn’t know that.